Health and Fitness concerns everyone: young, old, and everyone in between. At FPTS we are committed to continual improvement and bringing you new and updated programs. Below you will find our latest programs, details, and methods of getting involved. If you don’t see something you like, or something you are looking for, feel free to give us a call at 603.644.8334 or send an inquiry to: info@familyptservices.com. We are here to serve you! James Goodwin, PTA, CSCS, Director of Athletic Performance, will be combining his knowledge and experience in division 1 and professional athletics, exercise science, and rehab, along with his lifelong experience playing and coaching elite level soccer, to bring a program that is unparalleled in the world of injury prevention, conditioning, and performance education for young athletes. His programs are NOT about BIGGER, FASTER, or STRONGER, but about working smarter not harder. If you have an athlete that spends several hours a week between training and games, you can be sure that they are breaking down their young bodies. Regardless of their chosen sport, to prevent catastrophic injury and failure, it is crucial that they dedicate at least one hour per week rejuvenating their muscles and soft tissues, and James is an expert on how to do this. 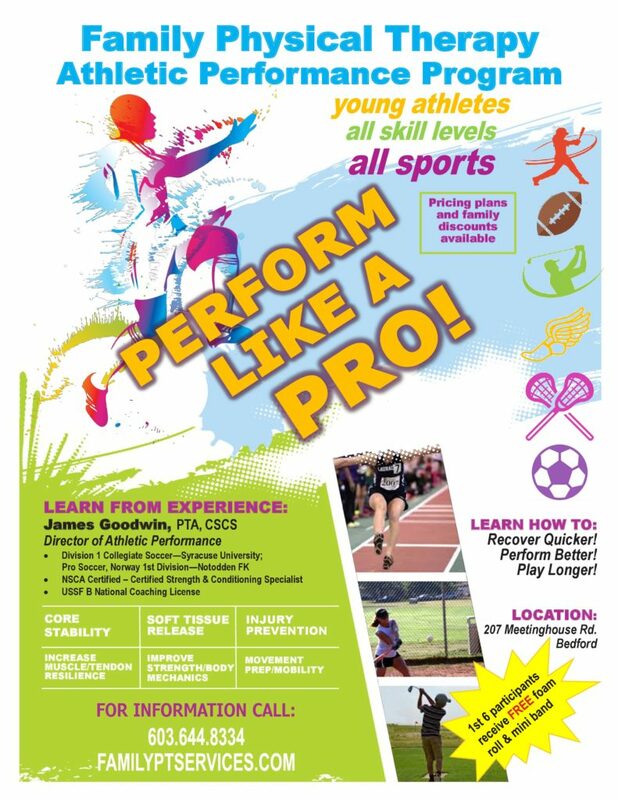 If you’d like to prevent season-ending injuries and give your children the opportunity to fulfill their dreams, enroll them in our 8 to 10 week Athletic Performance Program for Young Athletes. Give them a head start and a foot up on their competition. Help them stay in the game for the long haul and give yourself peace of mind that you are doing everything that you can to keep them injury free and at the top of their game. Interested in our Athletic Performance and Injury Prevention Programs or want to receive training tips, tissue recovery and performance tools that will help you STAY IN THE GAME?